Is there really a recipe for creating a world-class university? University World News carries a piece on what looks like a fascinating new publication from the World Bank on the making of world class universities. The report looks at a number of case studies, particularly from East Asia, and draws out several common characteristics of the most successful institutions. How do you build a world-class research university from scratch? In today’s ever-faster, global economy, many countries are reflecting on the merits of building elite global universities to make their mark in world research. 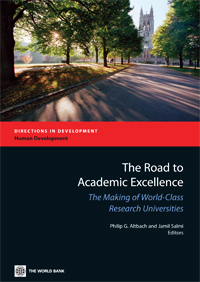 Recognizing that such universities are emerging as the central institutions of the 21st Century’s knowledge economies, a new book ‘The Road to Academic Excellence: The Making of World-Class Research Universities’ examines the recent experience of 11 universities in 9 countries on 4 continents that have grappled with the challenges of building successful research institutions under difficult circumstances, and synthesizes the lessons learned. This book will be essential reading for governments, tertiary education leaders, employers, and citizens, considering reforms and innovations to improve their country’s position in the global scene. Top-performing research universities share three common characteristics – a high concentration of talented academics and students, significant budgets and strategic vision and leadership, according to the authors. According to Salmi, what distinguishes successful East Asian universities from the rest of the world is an emphasis on international staff and students. “Both Shanghai Jiaotong University [China] and Pohang University of Science and technology [South Korea] made a strategic decision to rely principally on Chinese or Korean academics trained in the best universities in North America or Europe and, to a large extent, to recruit highly qualified foreign faculty,” he noted in the study. But he acknowledged that new research universities face special challenges in attracting top academics and good students. This enabled the institution to become a node for disseminating global knowledge within the country and region and to contribute to global knowledge, an important characteristic of world-class institutions. It’s perhaps not terribly surprising that you need top talent, plenty of money and some good leadership for a university to succeed. More interesting is that there seem to be only a modest number of institutions which have rapidly achieved world class status in the way described here. Maybe it’s harder to collect the ingredients and follow the recipe than it appears.